Plant cells separated by transparent cell walls. A cell wall is a fairly rigid layer surrounding, outside the cell membrane, the cells of plants and certain bacteria, archaea (archaebacteria), fungi, and algae. This extracellular matrix is characteristically absent from animal cells, although animal cells have extracellular matrix components on their surface (Alberts et al. 1989). Most protists also lack cell walls. The elaborate structure that is a cell wall provides important functions for cells. Cell walls provide structural support, protection, and act as a filtering mechanism. The cell wall also prevents over-expansion when water enters the cell. 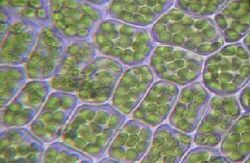 Most differences between plants and animals, including in motility, nutrition, growth, and reproduction, can be traced to the relatively rigid plant cell wall (Alberts et al. 1989). The materials in a cell wall vary between species. In plants, the strongest component of the complex cell wall is a carbohydrate polymer called cellulose. In bacteria, peptidoglycan forms the cell wall. Archaea have various chemical compositions, including glycoprotein S-layers, pseudopeptidoglycan, or polysaccharides. Fungi possess cell walls of chitin, and algae typically possess walls constructed of glycoproteins and polysaccharides; however certain algal species may have a cell wall composed of silicic acid. Often, other accessory molecules are found anchored to the cell wall. The cell wall, located outside the cell membrane or plasma membrane, serves a similar purpose in those organisms that possess them. The wall gives cells rigidity and strength, offering protection against mechanical stress. In multicellular organisms, it permits the organism to build and hold its shape (morphogenesis). The binding together of adjacent cell walls results in the cells of a plant being cemented together, forming the intact plant (Alberts et al. 1989). The cell wall also limits the entry of large molecules that may be toxic to the cell. It further permits the creation of a stable osmotic environment by preventing osmotic lysis and helping to retain water. The composition, properties, and form of the cell wall may change during the cell cycle and depend on growth conditions. Other cell walls are inflexible. In plants, a denser, less hydrated secondary cell wall is produced either from a thickening of the primary wall by adding more layers of cellulose or depositing layers of a different composition inside the cell wall (Alberts et al. 1989). Additional layers may be formed containing lignin in xylem cell walls, or containing suberin in cork cell walls. These compounds are rigid and waterproof, making the secondary wall stiff. Both wood and bark cells of trees have secondary walls. Other parts of plants, such as the leaf stalk, may acquire similar reinforcement to resist the strain of physical forces. Certain single-cell protists and algae also produce a rigid wall. 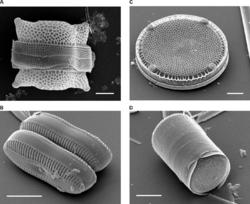 Diatoms build a frustule from silica extracted from the surrounding water; radiolarians also produce a test from minerals. Many green algae, such as the Dasycladales, encase their cells in a secreted skeleton of calcium carbonate. In each case, the wall is rigid and essentially inorganic. The rigid cell limits the exchange of molecules between the cell interior and its environment and restricts interaction and communication between cells (Alberts et al. 1989). Nonetheless, the primary cell wall of most plant cells is semi-permeable and permits the passage of small molecules and small proteins, with size exclusion estimated to be 30-60 kDa. Key nutrients, especially water and carbon dioxide, are distributed throughout the plant from cell wall to cell wall in apoplastic flow. Special channels connect the cytoplasm of neighboring plant cells, allowing the controlled passage of ions and small molecules. In vascular plants, cylindrical cells are connected end to end, resulting in long columns through which water and nutrients can flow (Alberts et al. 1989). The presence of a rigid cell wall is one of two major differences that distinguish plants from animals, the other being the ability to fix carbon dioxide by photosynthesis (Alberts et al. 1989). The presence of rigid cells walls means that multicellular plants have a nonmotile life-style and impacts differences in nutrition, digestion, growth, reproduction, osmoregulation, defense mechanisms, intercellular communication, and morphology (Alberts et al. 1989). Plant cell walls vary from 0.1 micrometers (µm) to many micrometers in thickness (Alberts et al. 1989). The primary cell wall, generally a thin, flexible, and extensible layer formed while the cell is growing. The primary cell walls of plants vary greatly in composition and organization, but basically are constructed from long fibers held together by a matrix of protein and polysaccharide (Alberts et al. 1989). The major carbohydrates making up the primary (growing) cell wall are cellulose, hemicellulose, and pectin. Fibers in the cell walls of higher plants generally are made from cellulose (Alberts et al. 1989), the most abundant organic (carbon-containing) compound on Earth. The matrix is composed primarily of hemicellulose and pectin, together with structural glycoproteins (Alberts et al. 1989). Hemicellulose is a heterogenous group of branched matrix polysaccharides that tightly bind to the surface of each cellulose microfibril and to one another; pectins are heterogenous branched molecules that contain many negatively charged galacturonic acid residues (Alberts et al. 1989). The cellulose microfibrils are linked via hemicellulosic tethers to form the cellulose-hemicellulose network, which is embedded in the pectin matrix. The most common hemicellulose in the primary cell wall is xyloglucan. In grass cell walls, xyloglucan and pectin are reduced in abundance and partially replaced by glucuronarabinoxylan, a hemicellulose. Primary cell walls characteristically extend (grow) by a mechanism called acid growth, which involves turgor-driven movement of the strong cellulose microfibrils within the weaker hemicellulose/pectin matrix, catalyzed by expansin proteins. The secondary cell walls provide most of the mechanical support for plants (Alberts et al. 1989). They may results from the laying down of more layers of cellulose (generally molecules of longer size than in the primary wall) or by laying down layers of a different composition. IN addition, the pectin components characteristic of primary walls are replaced by other, less hydrated polymers, resulting in a denser and less hydrated wall than the primary wall (Alberts et al. 1989). The major polymers that make up wood (largely secondary cell walls) include cellulose (35 to 50 percent), xylan (20 to 35 percent), a type of hemicellulose, and a complex phenolic polymer called lignin (10 to 25 percent). Lignin penetrates the spaces in the cell wall between cellulose, hemicellulose, and pectin components, driving out water and strengthening the wall. Secondary walls—especially in grasses —may also contain microscopic silicate crystals, which may strengthen the wall and protect it from herbivores. Plant cells walls also contain numerous enzymes, such as hydrolases, esterases, peroxidases, and transglycosylases, that cut, trim and cross link wall polymers. Small amounts of structural proteins (commonly 1 to 5 percent) are found in most plant cell walls; they are classified as hydroxyproline-rich glycoproteins (HRGP), arabinogalactan proteins (AGP), glycine-rich proteins (GRPs), and proline-rich proteins (PRPs). Alberts et al. (1989) note that glycoproteins may make up to ten percent of the primary wall mass. Each class of glycoprotein is defined by a characteristic, highly repetitive protein sequence. Most are glycosylated, contain hydroxyproline (Hyp), and become cross-linked in the cell wall. These proteins are often concentrated in specialized cells and in cell corners. Cell walls of the epidermis and endodermis may also contain suberin or cutin, two polyester-like polymers that protect the cell from herbivores (Moireet al. 1999). The relative composition of carbohydrates, secondary compounds, and protein varies between plants and between the cell type and age. The middle lamella is laid down first, formed from the cell plate during cytokinesis, and the primary cell wall is then deposited inside the middle lamella. The actual structure of the cell wall is not clearly defined and several models exist—the covalently linked cross model, the tether model, the diffuse layer model, and the stratified layer model. However, the primary cell wall, can be defined as composed of cellulose microfibrils aligned at all angles. Microfibrils are held together by hydrogen bonds to provide a high tensile strength. The cells are held together and share the gelatinous membrane called the middle lamella, which contains magnesium and calcium pectates (salts of pectic acid). In some plants and cell types, after a maximum size or point in development has been reached, a secondary wall is constructed between the plant cell and primary wall. Unlike the primary wall, the microfibrils are aligned mostly in the same direction, and with each additional layer the orientation changes slightly. Cells with secondary cell walls are rigid. Trees modify cell walls in their branches to reinforce and support structure (Wilson 1984). Conifers, such as pine, produce thicker cell walls on the undersides of branches to push their branches upwards. The resulting wood is called compression wood. By contrast, hardwood trees reinforce the walls on the upper sides of branches to pull their branches up. This is known as tension wood. Additional thickening may occur in other parts of the plant in response to mechanical stress. Cells interact though plasmodesma(ta), which are inter-connecting channels of cytoplasm that connect to the protoplasts of adjacent cells across the cell wall. In cells with secondary cell walls, cell to cell communication is possible through pits in the secondary cell wall, which allow plasmodesma to connect cells through the secondary cell walls. Like plants, algae have cell walls (Sengbusch 2003). Algal cell walls contain cellulose and a variety of glycoproteins. The inclusion of additional polysaccharides in algal cells walls is used as a feature for algal taxonomy. Mannosyls form microfibrils in the cell walls of a number of marine green algae including those from the genera, Codium, Dasycladus, and Acetabularia as well as in the walls of some red algae, like Porphyra and Bangia. Xylanes. Xylan refers to a wide variety of highly complex polysaccharides that are found in plant cell walls and some algae, such as replacing cellulose in some green algae and red algae. Sulfonated polysaccharides occur in the cell walls of most algae; those common in red algae include agarose, carrageenan, porphyran, furcelleran, and funoran. The group of algae known as the diatoms synthesize their cell walls (also known as frustules or valves) from silicic acid (specifically orthosilicic acid, H4SiO4). The acid is polymerized intra-cellularly, then the wall is extruded to protect the cell. Significantly, relative to the organic cell walls produced by other groups, silica frustules require less energy to synthesize (approximately 8 percent), potentially a major saving on the overall cell energy budget (Raven 1983), and possibly an explanation for higher growth rates in diatoms (Furnas 1990). Fungi make up one of the kingdoms into which living things are divided by biologists. A fungus is a eukaryotic organism that digests its food externally and absorbs the nutrient molecules into its cells. Fungi differ from bacteria in having a cell nucleus; from plants in not making their own food through photosynthesis; and from animals in not being mobile and in absorbing nutrition externally rather than internally. Fungi include mushrooms, yeasts, molds, mildews, and others. There are several groups of organisms that may be called "fungi," but some traditionally called fungi have been transferred out of the Kingdom Fungi, in part because of fundamental biochemical differences in the composition of the cell wall. Most true fungi have a cell wall consisting largely of chitin and other polysaccharides (Hudler 1998). True fungi do not have cellulose in their cell walls, but some fungus-like organisms do. a layer of mannoproteins (mannose-containing glycoproteins), which are heavily glycosylated at the outside of the cell. The group Oomycetes, also known as water molds, are saprotrophic plant pathogens like fungi. Until recently they were widely believed to be fungi, but structural and molecular evidence (Sengbusch 2003b) has led to their reclassification as heterokonts, related to autotrophic brown algae and diatoms. Unlike fungi, oomycetes typically possess cell walls of cellulose and glucans rather than chitin, although some genera (such as Achlya and Saprolegnia) do have chitin in their walls (Alexopoulos et al. 1996). The fraction of cellulose in the walls is no more than 4 to 20 percent, far less than the fraction comprised by glucans (Alexopoulos et al. 1996). Oomycete cell walls also contain the amino acid hydroxyproline, which is not found in fungal cell walls. The dictyostelids are another group formerly classified among the fungi. They are slime molds that feed as unicellular amoebae, but aggregate into a reproductive stalk and sporangium under certain conditions. Cells of the reproductive stalk, as well as the spores formed at the apex, possess a cellulose wall (Raper 1984). The spore wall has been shown to possess three layers, the middle of which is composed primarily of cellulose, and the innermost is sensitive to cellulase and pronase (Raper 1984). Like plants, bacteria have a cell wall found outside the plasma membrane—the plasma membrane being the single membrane of gram positive bacteria and being the inner of the two lipid bilayer membranes of gram negative bacteria (Alberts et al. 1989). In the later, such as E. coli, the bacterial cell wall is the highly porous, rigid peptidoglycan, composed of protein and polysaccharide, that is located between the inner membrane (the plasma membrane) and the outer membrane (Alberts et al. 1989). In single membrane bacteria (gram positive bacteria), such as staphylococci and streptococci, the cell wall is thicker (Alberts et al. 1989). Bacterial cell walls are made of peptidoglycan (also called murein), which is made from polysaccharide chains cross-linked by unusual peptides containing D-amino acids (van Heijenoort 2001). Bacterial cell walls are different from the cell walls of plants and fungi, which are made of cellulose and chitin, respectively (Koch 2003). The cell wall of bacteria is also distinct from that of Archaea, which do not contain peptidoglycan. 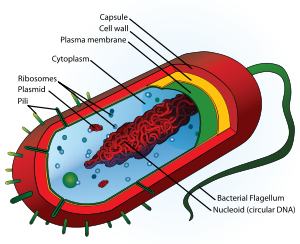 The cell wall is essential to the survival of many bacteria. The antibiotic penicillin is able to kill bacteria by inhibiting a step in the synthesis of peptidoglycan (Koch 2003). There are broadly speaking two different types of cell walls, reflecting the two broad classifications of bacteria, Gram-positive bacteria and Gram-negative bacteria. The names originate from the reaction of cells to the Gram stain, a test long-employed for the classification of bacterial species (Gram 1884). Gram-positive bacteria possess a thick cell wall containing many layers of peptidoglycan and teichoic acids. In contrast, Gram-negative bacteria have a relatively thin cell wall consisting of a few layers of peptidoglycan surrounded by a second lipid membrane containing lipopolysaccharides and lipoproteins. Gram-positive organisms are able to retain the crystal violet stain employed in the test because of the high amount of peptidoglycan in the cell wall. Most bacteria have the Gram-negative cell wall and only the Firmicutes and Actinobacteria (previously known as the low G+C and high G+C Gram-positive bacteria, respectively) have the alternative Gram-positive arrangement (Hugenholtz 2002). These differences in structure can produce differences in antibiotic susceptibility, for instance vancomycin can kill only Gram-positive bacteria and is ineffective against Gram-negative pathogens, such as Haemophilus influenzae or Pseudomonas aeruginosa (Walsh and Amyes 2004). Although not truly unique, the cell walls of Archaea are unusual. Whereas peptidoglycan is a standard component of all bacterial cell walls, all archaeal cell walls lack peptidoglycan (White 1995), with the exception of one group of methanogens (Howland 2000). In that group, the peptidoglycan is a modified form very different from the kind found in bacteria (White 1995). There are four types of cell wall currently known among the Archaea. One type of archaeal cell wall is that composed of pseudopeptidoglycan (also called pseudomurein). This type of wall is found in some methanogens, such as Methanobacterium and Methanothermus (Brock et al. 1994). While the overall structure of archaeal pseudopeptidoglycan superficially resembles that of bacterial peptidoglycan, there are a number of significant chemical differences. Like the peptidoglycan found in bacterial cell walls, pseudopeptidoglycan consists of polymer chains of glycan cross-linked by short peptide connections. However, unlike peptidoglycan, the sugar N-acetylmuramic acid is replaced by N-acetyltalosaminuronic acid (White 1995) and the two sugars are bonded with a β,1-3 glycosidic linkage instead of β,1-4. Additionally, the cross-linking peptides are L-amino acids rather than D-amino acids as they are in bacteria (Brocket et al. 1994). A second type of archaeal cell wall is found in Methanosarcina and Halococcus. This type of cell wall is composed entirely of a thick layer of polysaccharides, which may be sulfated in the case of Halococcus (Brock et al. 1994). Structure in this type of wall is complex and as yet is not fully investigated. A third type of wall among the Archaea consists of glycoprotein, and occurs in the hyperthermophiles, Halobacterium, and some methanogens. In Halobacterium, the proteins in the wall have a high content of acidic amino acids, giving the wall an overall negative charge. The result is an unstable structure that is stabilized by the presence of large quantities of positive sodium ions that neutralize the charge (Brock et al. 1994). Consequently, Halobacterium thrives only under conditions with high salinity. In other Archaea, such as Methanomicrobium and Desulfurococcus, the wall may be composed only of surface-layer proteins (Howland 2000), known as an S-layer. S-layers are common in bacteria, where they serve as either the sole cell-wall component or an outer layer in conjunction with peptidoglycan and murein. Most Archaea are Gram-negative, though at least one Gram-positive member is known (Howland 2000). Alexopoulos, C. J., C. W. Mims, and M. Blackwell. 1996. Introductory Mycology. New York: John Wiley & Sons. ISBN 0471522295. Brock, T. D., M. T. Madigan, J. M. Martinko, and J. Parker. 1994. Biology of Microorganisms, 7th ed. Englewood Cliffs, NJ: Prentice Hall. ISBN 0130421693. Buchanan, B. B., W. Gruissem, and R. L. Jones. 2000. Biochemistry and Molecular Biology of Plants. Rockville, MD: American Society of Plant Physiologists. ISBN 0943088399. Furnas, M. J. 1990. In situ growth rates of marine phytoplankton: Approaches to measurement, community and species growth rates. J. Plankton Res. 12: 1117-1151. Hudler, G. W. 1998. Magical Mushrooms, Mischievous Molds. Princeton, NJ: Princeton University Press. ISBN 0691028737. Hugenholtz, P. 2002. Exploring prokaryotic diversity in the genomic era. Genome Biol 3(2). PMID 11864374. Retrieved July 10, 2008. Koch, A. 2003. Bacterial wall as target for attack: Past, present, and future research. Clin Microbiol Rev 16(4): 673–687. PMID 14557293. Retrieved July 10, 2008. Moire, L., A. Schmutz, A. Buchala, B. Yan, R. E. Stark, and U. Ryser. 1999. Glycerol is a suberin monomer. New experimental evidence for an old hypothesis. Plant Physiol. 119: 1137-1146. Retrieved July 10, 2008. Raper, K. B. 1984. The Dictyostelids. Princeton, NJ: Princeton University Press. ISBN 0691083452. Sengbusch, P. V. 2003a. Cell walls of algae. University of Hamburg, Department of Biology. Retrieved July 10, 2008. Sengbusch, P. V. 2003b. "Interactions between plants and fungi: The evolution of their parasitic and symbiotic relations. University of Hamburg, Department of Biology. Retrieved July 10, 2008.
van Heijenoort, J. 2001. Formation of the glycan chains in the synthesis of bacterial peptidoglycan. Glycobiology 11(3): 25R–36R. PMID 11320055. Retrieved July 10, 2008. Walsh, F., and S. Amyes. 2004. Microbiology and drug resistance mechanisms of fully resistant pathogens. Curr Opin Microbiol 7(5): 439-444. PMID 15451497. Retrieved July 10, 2008. White, D. 1995. The Physiology and Biochemistry of Prokaryotes. Oxford: Oxford University Press. ISBN 019508439X. Wilson, B. F. 1984. The Growing Tree. Amherst, MA: University of Massachusetts Press. ISBN 0870234242. This page was last modified on 20 January 2017, at 21:25.